Hi, I also couldn't use the SetBiome filter because of the error: "AnvilChunk object has no attribute decompress". So I tried older versions of MC Edit and I found one where I could use the filter, so I downloaded it and it's working for me. A couple of times, when I selected a too large of an area it said error: "70, 47" or something like that, but when I selected a smaller area it was working fine. 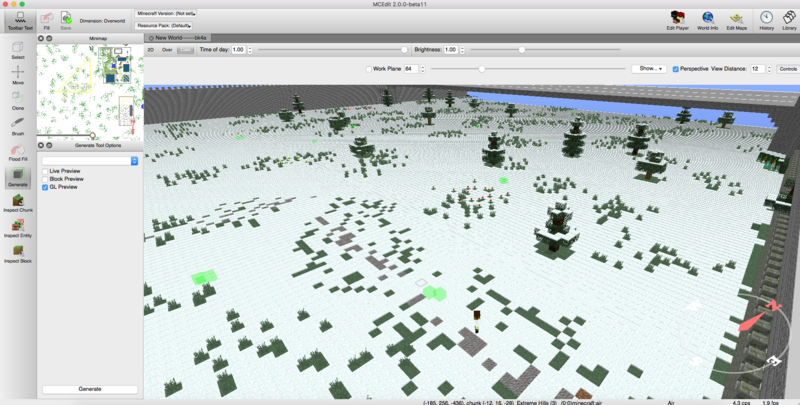 EDIT: Later on, with that version, I sometimes got the error: "Key biomes not found". So I downloaded a 0.1.5 version because SethBling said it was working fine for him. For me, sometimes it works, sometimes it doesn't. Location: Out of my mind, back in five. Thus far, the tool has worked perfectly for my needs. Then again, I'm only working with 20x20 sections. My zoo wouldn't be nearly as complete without this great tool. Not for me, even when going to a 1 block selection it won't work. Maybe it has to do with the worlds themselves, I tried to use it on a custom superflat that generated nothing but air and then pasted the parts into it that I wanted. Ok, interestingly, I think that when you start with a selection too big it won't work, going smaller then produces the same error. I've tried it the other way around, going from small to big, and that worked fine. Once too big, I get the "Key Biomes not found" error now, and then going smaller again (no matter how small of a selection) will continue to produce that error. But yeah, it works... did this on the 0.1.5 install. After getting this error, doing a restart of mcedit makes it work again for me. Your filters are amazing, by the way. I can't do without them in mapmaking... Really appreciated, Sethbling! if you are getting the "AnvilChunk object has no Attribute decompress" bug. all you have﻿ to do is remove the line "chunk.decompress()" from the filters coding. I'm getting the 'Exception during filter operation. See console for details. 'AnvilChunk' object has no attribute 'decompress'' error as well on 0.1.6. Exeption during filter opperation. see console for details. "AnvilChunk" object has no attribute "decompress". does anyone know what i need to do to fix this error. Sethbling, your latest update to the filter works. I just downloaded it, replaced the original setbiome.py with the new one, and opened MCedit back up and it's good to go. Thanks for making such awesome stuff! Do Not Read This Signature. In order to do this click on setbiome.py and open it with notepad. Next scroll down to the bottom of the note and erase the line. Make Sure to SAVE after you are done. That is all you have to do. Hope this helps. Will this command work for extraboiomesXL? Where is the filters folder?